Nestled next to the beautiful Rocky Mountains (the world’s most spectacular playground), Denver is a hot-spot for your summer professional development. To supplement your convention experience, Denver provides top-notch shopping, a growing dining scene, and more than 200 beers brewed daily in town. 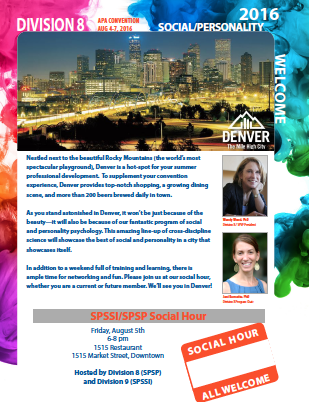 As you stand astonished in Denver, it won’t be just because of the beauty—it will also be because of our fantastic program of social and personality psychology. This amazing line-up of cross-discipline science will showcase the best of social and personality in a city that showcases itself. In addition to a weekend full of training and learning, there is ample time for networking and fun. Please join us at our social hour, whether you are a current or future member. We’ll see you in Denver!